The Helen Hills Hills Chapel welcomed Bishop Mitchell Rozanski on Sunday, October 14, 2018. At 4pm, Bishop of the Diocese of Springfield celebrated Mass in recognition of Smith alum Mollie Rogers. 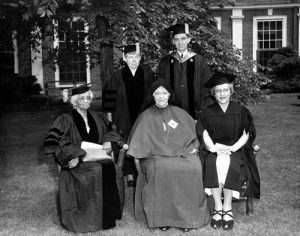 Mollie, 1905 graduate of Smith College, took the name Mother Mary Joseph and founded the Maryknoll Sisters. Her time at Smith was marked by devotion to the Student Volunteer Movement; Mollie led what is presumed to be the first-ever session at Smith on Catholic missions. In June of her Junior year at Smith, the faith and gratitude cultivated by Mollie through her mission work at Smith led her to the tabernacle at St Mary’s Church in Northampton. Praying in front of the church, Mollie made a solemn and joyous vow. Though she did know how she would fulfill her pledge, Mollie committed herself to the Church. Mollie’s legacy at Smith is broad; she returned to the college following graduation as a demonstrator in pursuit of her Masters’ degree. In 1906, Mollie was in the process of founding a Catholic mission club at Smith. The organization later became the Newman club. Jump forward 100 years and a Catholic Smithie has this to say about October’s special Mass: “It’s validating to see that social justice and faith can work together, and also to see a very early feminist… because we don’t have to be secular to be radical”. 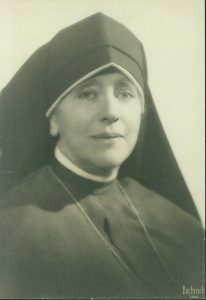 In February of 1920, Mollie lead a religious congregation of 35 women. From then on, she was known as Mary Mother Joseph. The congregation grew to encompass 1,160 members. The Maryknoll sisters “opened missions in twenty countries, and were serving racial minorities in six cities in the United States” (Maryknoll Sisters). A woman of faith and of justice, Mother Mary Joseph upheld a firm belief in unity, equality, and interpersonal respect. From her work in missions beyond the United States to her dedicated service to her own communities, Mother Mary Joseph encouraged her peers to cultivate an active relationship with God. Her archived past illustrates a woman who knew that we must nurture ourselves on a personal level before exerting our faith in community action. Read more about Mollie and her legacy here. This entry was posted in Programs & Events and tagged campus news, Catholic, Christianity, community, identity, interfaith. Bookmark the permalink.